Saturday proved to be a good day for both Percy Main sides as the first team defeated Ponteland at home to complete the double over their relegation threatened rivals. Meanwhile the second team also completed the double over promotion rivals Benwell and Walbottle. At St John’s Terrace, skipper Mark Armstrong was without Barry a Errington behind the stumps, so Dave Anderson took his place as veteran Richie Walker returned also. 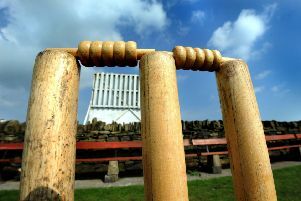 Armstrong won the toss and decided to bat. Openers Anderson and Stewart moved towards 47 without loss, despite both being dropped early on, before Anderson was dismissed lbw by Waters for 24. Stewart quickly followed with the score on 52 as he was bowled by Waters again. Mitch Reid and Mickey Phillips then upped the tempo to take the score to 98, before Phillips was unfortunate to be run out. Once Reid was dismissed for 36 and after Cramman and Stanistreet had been dismissed cheaply, Main were in deep trouble at 120-6. However, in-form Andrew Green, assisted by Prested, then batted beautifully to take the score past 200, with Green hitting another 50. Despite his dismissal, some later order big hitting by Michael Boyd and Walker enabled the villagers to post a competitive 227-9. In reply, the potent strike force of Green and Stewart made early inroads, reducing Ponteland to 24-2 with both openers back in the pavilion. Australian Whiteley then came to the crease and began to rebuild the innings assisted by Penfold, before the latter was dismissed for 19 by Armstrong. Stuart Taylor quickly followed, again bowled by Armstrong with a ripper of a delivery to leave the visitors on 86-4. This became 101-5 when Lumb was bounced out by the medium pace trundler Phil Cramman. In truth, the game was delicately poised at this point as Whitely was looking well set. Along with Appleby, the pair took the visitors to 162-6 before Whitely was dismissed by Walker, who was well caught by Armstrong. However, Main tightened the screw with some accurate bowling as Ponteland fell short, reaching 190-7 with Stewart claiming the final wicket. This result lifted the villagers to sixth. At Walbottle campus, stand-in skipper Steve Peart led a youthful second team in their top of the table encounter. Sam Bierley, Dan McGee, James Peart and Laurie Robson all are under 14 and each showed their quality in a superb team performance, which highlighted the strength of Percy Main’s flourishing junior section. Peart won the toss and elected to bowl, and alongside wily veteran Blyth Duncan, they bowled through their overs to reduce the hosts to 50-3 with Peart claiming all of the wickets to record figures of 3-22, two of which to superb catches in the slips by his son James and a superb one handed take at gully by Steve Patterson. At this point McGee was introduced and he continued to show his quality and potential with a superb spell of left arm spin bowling, taking 4-40. He was assisted by Patterson (3-26) at the top end, who claimed the final three wickets to bowl out Benwell and Walbottle for 147. In reply, Main made a terrible start and were reduced to 30-4 as some excellent, tight bowling by Jeavons and Taylor sent Tony Robson, Smith, Jenkins and James Peart back. At this point defeat was on the cards, however, skipper Peart and Andy Beer bludgeoned Main back into the contest before Peart was dismissed to leave the visitors 74-5. Patterson then joined Beer and the pair played intelligently to take the side to 112 before Beer holed out for 44. This brought young Laurie Robson to the crease and despite needing six an over, Main made it home with five overs to spare, fittingly Robson hitting the wining runs as Patterson made an entertaining 36 not out. This maintained the second team’s top spot in the division.